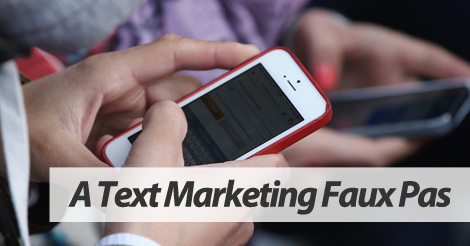 Text message marketing makes sense for most, if not all small business owners. Now, let’s say that you’ve signed up for a free plan. You’re ready to start growing your text message marketing list, so you fire out some pretty sweet mobile offers. Initially, the offer redemption skyrockets. A couple months later, and something just doesn’t seem right. Your churn rate has drastically increased. Opt outs are a daily occurrence, and sometimes even hit the double digits. Considering the amount of time you’ve invested into your text message marketing list, this isn’t something you want, right? You find yourself rewinding the clock, asking yourself what happened … how your list just suddenly vanished?! Well, chances are you committed the cardinal sin of all cardinal sins. The absolute worst text message marketing faux pas of all time. Are you on the edge of your seats yet? Are you ready to come to terms with your mistakes, and move forward with SMS in a productive way? Chances are, your message doesn’t represent YOU. What do we mean by that? Your messages aren’t on brand. As a new text message marketing user, your first reaction might be to use shortened text speak. Here’s an example. Get this offer b4 it expires!! 50% off ur next order…code 50! That’s totally the wrong way to do it. Instead, use full sentences and professional language. Not sure what that looks like? Try something like this. Want 50% off your next order at Bob’s Ties? Use code 50 at checkout, offer expires 4/22. Does that make sense? When you see the first example, you aren’t sure who sent it. It looks unqualified. Because of this, you will mostly likely delete this message, and even unsubscribe from that list. So, from a text message marketing user standpoint, you need to make sure every single message is offering some sort of value. On top of that, you need to make sure all messages are fully representing your business. Want to learn more? Give us a call at 1.800.688.6290 to learn more, or head over to the pricing page and sign up for a free plan.